A new full-length trailer for Castle Rock has arrived. The fictional town has been a major fixture in Stephen King's works for a long time and now, J.J. Abrams has turned it into a TV series for Hulu that looks very much like it could be the show that fans of King's work have dreamed about for years. This new trailer gives us our first real sense of the story at play, as opposed to previous teasers that gave us only a vague taste of what's in store. It looks like we're in for one seriously terrifying ride. 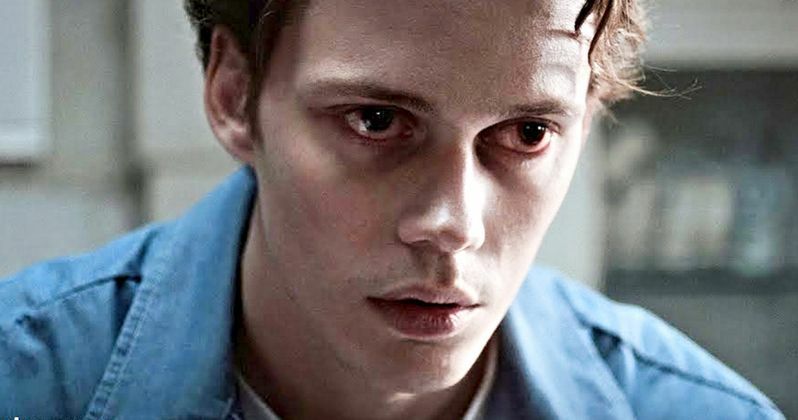 Things start off rather ominously as Bill Skarsgard has somehow snuck into Shawshank Prison and nobody seems to know who he is or how he got in there. He then asks, "Has it begun?" Things get extra creepy from there. The trailer turns into a sequence of unsettling shots, with people all over the town of Castle Rock finding themselves in horrific situations. This is all perfectly set to the tune of Ricky Nelson's Lonesome Town, which really helps drive home the tone. We also finally have a full synopsis for the series, which reads as follows. "A psychological-horror series set in the Stephen King multiverse, Castle Rock combines the mythological scale and intimate character storytelling of King's best-loved works, weaving an epic saga of darkness and light, played out on a few square miles of Maine woodland. The fictional Maine town of Castle Rock has figured prominently in King's literary career: Cujo, The Dark Half, IT and Needful Things, as well as novella The Body and numerous short stories such as Rita Hayworth and The Shawshank Redemption are either set there or contain references to Castle Rock. Castle Rock is an original suspense/thriller, a first-of-its-kind reimagining that explores the themes and worlds uniting the entire King canon, while brushing up against some of his most iconic and beloved stories." One of the most intriguing things about Castle Rock is the cast that the creative team has assembled. Bill Skarsgard and Chosen Jacobs starred in last year's IT and are both on board, with original Carrie actress Sissy Spacek as one of the leads. But all of them are playing new roles here, which is fascinating. Though, Skarsgard does appear to be bringing his same level of creepiness to this new part as he did with Pennywise, even without the makeup. That's pretty impressive. Stephen King fans should have a good time looking for Easter eggs hidden in this trailer. Some, such as the Cujo and IT references are pretty easy to pick up on, but no less intriguing. Castle Rock is set to make its debut next weekend during San Diego Comic-Con just a few days before Hulu premieres the first three episodes on July 25. It is a very exciting time to be a Stephen King fan. Be sure to check out the new Castle Rock trailer, courtesy of the Hulu YouTube channel, for yourself below.